It is common in our daily practice as veterinary surgeons to see dogs presented with pruritus (itchy skin) which is often driving the patient and the owner mad! 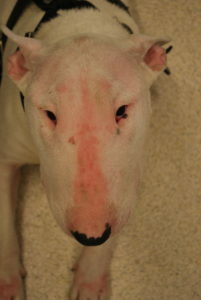 Nowadays we often think that an allergy is the most likely cause especially in those breeds in which allergy is common. More and more frequently I see dogs which have been diagnosed too quickly with an ‘allergy’ and being treated with one of the drugs commonly used for treating it. There is often either a lack of, or a poor response. If you as a dog owner are facing a similar situation, keep reading this blog! · Rule out ectoparasites. Fleas may still be present even during the winter months and the environmental conditions in houses (warm temperature and humidity) will keep fleas reproducing unless a thorough ectoparasite disinfestation is carried following their detection. Proper environmental disinfestation and specific oral or spot on therapy are essential in eradicating the indoor flea population. During the spring/summer months it is very common for dogs to spend more time outside and sharing places with other dogs or playing with other dogs; so the opportunities to catch fleas are quite high. Take home message: if ectoparasites are suspected/identified make sure all pets in the house are treated properly and routinely. The indoor environment including cars, garage and any place where the pet spends part of his/her time should be disinfested regularly. Usually strict flea control over a period of 3 months should eradicate the infestations but as re-infestation is very likely to occur, prevention is the best way to avoid our pets being re-infested. 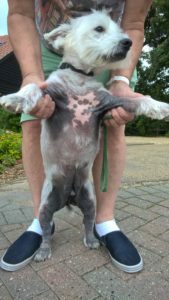 · Rule out mange like scabies especially if there are foxes in the neighbourhood. I have seen allergic dogs which were well controlled with the allergy vaccine or specific medical therapy but they had suddenly become more and more itchy. Although even well controlled allergic dogs can have flare ups throughout the year, the persistence of pruritus, despite control of secondary bacterial or yeast infections or increased doses of the specific medication, should suggest that something else may be going on. Ask your veterinary surgeon to carry out skin scrapings. Finding the mites or their eggs may be difficult due to their low number. Often referral to a Specialist in Dermatology may help reaching the diagnosis quickly. Take home message: if scabies is suspected, an acaricidal therapy should be applied and modern spot on or oral drugs are very effective not just against fleas and ticks but also for scabies. Do not ask for more oral steroids or for additional ‘anti-allergy drugs’ assuming that the allergy has become more difficult to control. Often there is a simple reason why a well-controlled allergic pet has become very pruritic. Often dogs with scabies will pass on the mange to other dogs or even their owners so a sudden onset of itchiness in more than one family member should lead to the suspicion of a contagious disease. Rule out bacterial and/or yeast infections. Secondary bacterial and/or yeast infections are common in dogs with allergies or endocrinopathies and would make an affected dog very pruritic. Lesions often occur on the underside of the dog, axillae and medial surfaces of the thighs and groin. Lesions of the trunk are associated with focal areas of hair loss, or so-called ‘moth-eaten appearance’. Often there is greasiness of the skin or smelly ear with excessive amount of wax or even pus. In these cases ask your veterinary surgeon to do some diagnostic tests like cytology or culture and sensitivity. A common clinical presentation during the warm season is the ‘hot spot’. This condition is an acute moist dermatitis which commonly occurs when self-inflicted damage to the skin surface disrupts the epidermis and allows proliferation of bacteria. It commonly occurs in dogs infested by ectoparasites and there may be a secondary bacterial infection. There is usually a moist, painful, focal area(s) of redness and hair loss, often on the gluteal region, arising within hours. Beware as the lesion may be painful and dogs may bite. Gently cleaning the affected area and use of astringents and antiseptics are usually enough to control the lesions while addressing the underlying cause. Check for fleas or ask your veterinary surgeon to check for other ectoparasites or an underlying allergy. Improvement usually occurs within a few days. Often topical therapy is enough to control even more widespread bacterial and/or yeast infections. A combination of a shampoo and spray containing 4% chlorhexidine are a valid therapy which helps avoid unnecessary use of oral antibiotics. Take home message. Make sure you are dispensing antibiotics wisely, at the correct dose and length of treatment. Remember that shampoo and topical therapy are also effective in controlling bacterial/yeast populations. Often superficial pyoderma or yeast dermatitis resolve just with topical therapy. · Running allergy tests. Allergy tests should only be done when dogs are suspected of having atopic dermatitis (environmental allergy) and when all the other causes of pruritus or allergy have been ruled out. Usually your veterinary surgeon will look at the compatible history and clinical signs, response to dietary restriction and relapse on provocative exposure and may decide to refer your dog for intradermal and/or serological tests. Please note, these may be of no use in diagnosing a dietary sensitivity. Take home message. Avoid wasting your money or your insurance allocation on allergy tests for food allergy as the results may be unreliable or difficult to interpret. On the other side environmental allergy tests are reliable but they should only be carried out if the allergy vaccine is an option to be considered for the treatment of the environmental allergy.